A NUMBER OF staff at University Hospital Galway have been disciplined over their role in the Savita Halappanavar case. The 31-year-old died at the hospital in 2012 after suffering a miscarriage. A year later, the West/North West Hospital Group pledged to review the actions of all staff members involved in the care of Halappanavar. This was “in the interest of restoring public confidence in the maternity services at University Hospital Galway”. Out of 30 staff members whose actions were considered, 21 had “no case to answer”, according to a statement from the hospital group. This would have included staff in areas such as the Intensive Care Unit. The disciplinary process is still under-way for some staff. The solicitor of Praveen Halappanavar’s, Savita’s husband, said that he had received no communication regarding the disciplinary action. 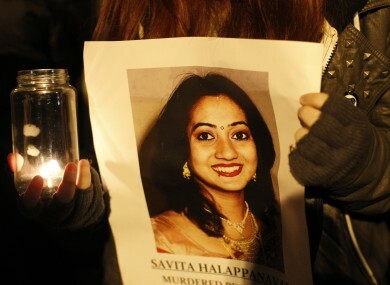 He added that while “nothing will bring back Savita”, he hopes that lessons have learned from her death. O’Donnell noted that Praveen Halappanavar is currently not in the country. Among the nine staff disciplined, some received ‘informal counselling with training and mentoring was applied’, while others were issued with written warnings. University Hospital Galway has also defended itself against low marks received for the implementation of HIQA recommendations. “It must be borne in mind that this is a self-assessment process and we do not see it as a negative if we have marked ourselves hard on this self-assessment,” the statement added. The results of an external review of the changes in care, requested by the board of the hospital group, is expected in November. Email “Staff disciplined over their role in the care of Savita Halappanavar”. Feedback on “Staff disciplined over their role in the care of Savita Halappanavar”.